Recently, I traveled to Colombia for Colombiamoda, that country's fashion week. (More on that here later!) To prepare for my trip, I downloaded a number of travel-related phone apps. 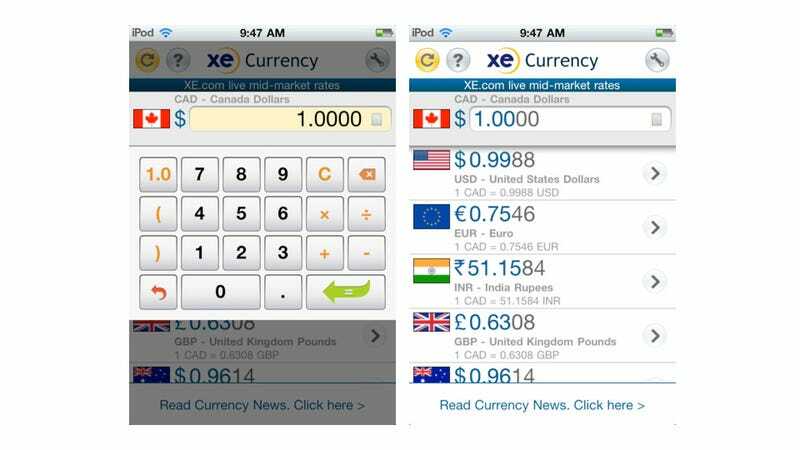 The best designed, easiest to use, and most useful one by far was XE's currency converter app. It works very simply: you select which currencies you want to convert from and into (just drag and drop to re-order or swap), how often you want the app to update the rates (up to once per minute, but I selected "Never" because I didn't want to get dinged with roaming charges and just refreshed manually about once a day when I had wi-fi), and with the touch of a button you can open up a graph that displays historical data about that currency conversion rate (going back up to one year). Once you set your "anchor" currency — the one you're converting from — you can instantly and simultaneously see a price in that currency rendered in Euros, U.S. dollars, New Zealand dollars, pounds sterling, or any other form of money that strikes your fancy. It's a cinch to add and delete currencies from your list. And because the rates are saved with every refresh, you can make conversions even while you are offline. And the app is obviously a lot more accurate than the "It's more or less times .65, right?" conversions I used to do with my phone's calculator. Best of all, the XE app is free.